The triangle-shaped Old Town is surrounded by the Paillon river valley to the north (the river is buried underground but on top the local authorities are currently planting a very attractive new garden called the “coulee verte” which will be ready by 2013 – EDIT: this is now open and is now called the Promenade du Paillon, see the corresponding article for more information ), by the Castle Hill to the east and the Mediterranean Sea to the south, just across the Quai des Etats Unis. 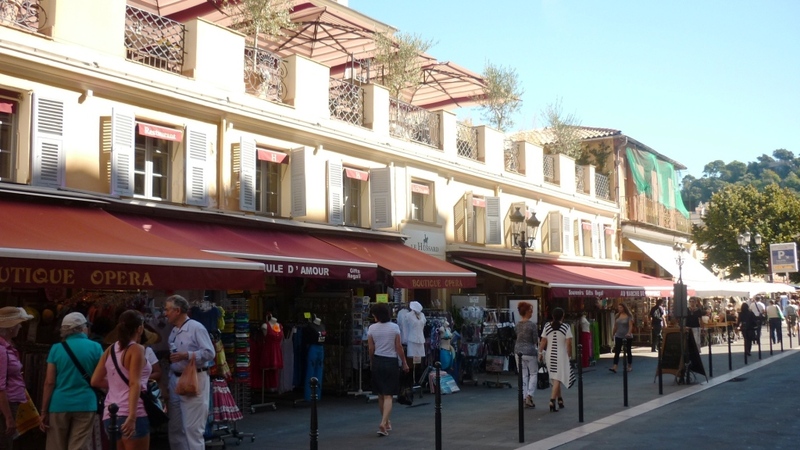 – Starting from Place Massena, just take the pleasant rue St François de Paule, which is lined with some classy shops with the beautiful Belle Epoque Opera of Nice on the right. 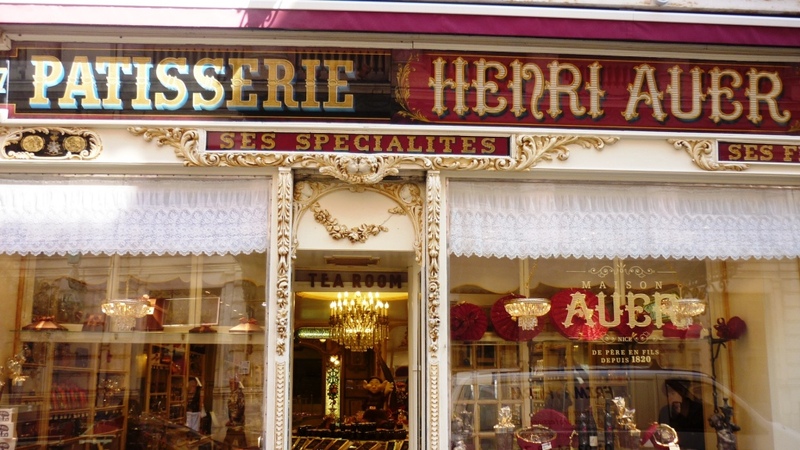 One of my favourite shops in Old Nice in terms of decoration, the wonderful Auer chocolate and sweet shop on rue St François de Paule, dating from 1820 when Napoleon was still alive: the inside is still decorated in pure 19th century style. Just after the opera on the left, you will get a glimpse of the large Palace Square (referring to the rather bulky and unattractive Palace of Justice/law courts) which has some terraces but isn’t the most pleasant part of the Old Town to stop over in, so just keep going straight down the road until you hit the pedestrian area where the street becomes the “Cours Saleya”. 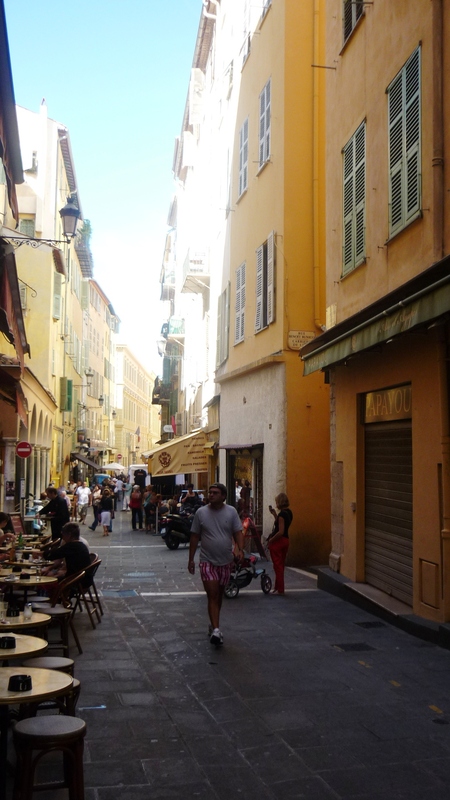 – The Cours Saleya (or “Corso” in the local Nissart dialect – all the streets names in the Old Town are both in French and Nissart), running parallel to the sea, is one of the liveliest streets of Old Nice. In the morning, the central part of the street becomes a market: mainly for flowers but also for jumble sales or fruits and vegetables depending on the days. The strip is also lined with plenty of restaurants which are reasonably priced but varying in quality, so be wary, though the appeal of people-watching and soaking in the incomparable Mediterranean atmosphere can just about justify paying slightly more than elsewhere for a coffee or a quick meal. It’s also a great place to grab a portion of socca at Chez Theresa (see below in the food section) if she’s around. – Once you get to the end of the Cours Saleya, you can either turn right and head towards the waterfront and enjoy some sumptuous views over the whole Baie des Anges from the Castle Hill, or else carry on the tour of the Old Town and go left. Running parallel to Cours Saleya is the rue de la Préfecture which heads back towards Place du Palais and comes to life in the early evenings at around 5 or 6pm, which is aperitif time in Nice. The street is lined with bars (mainly English-style pubs or more upmarket lounges) and some pretty decent restaurants. – North of the rue de la Préfecture, towards the top end of the triangle, the streets get narrower as cars are banned and this is the ideal place to just wander around the area up to Place Garibaldi to the north. This area is full of bars and restaurants, especially the southern end, around Place Rossetti, which is another of the nerve centres of the Old Town and an ideal place to just sit down and have a drink on a terrace, under the shade of the beautiful baroque Cathédrale Sainte Réparate, built in the late 17th century. It is also a perfect place to have an ice cream at the famous Fenocchio parlour, see the description below. 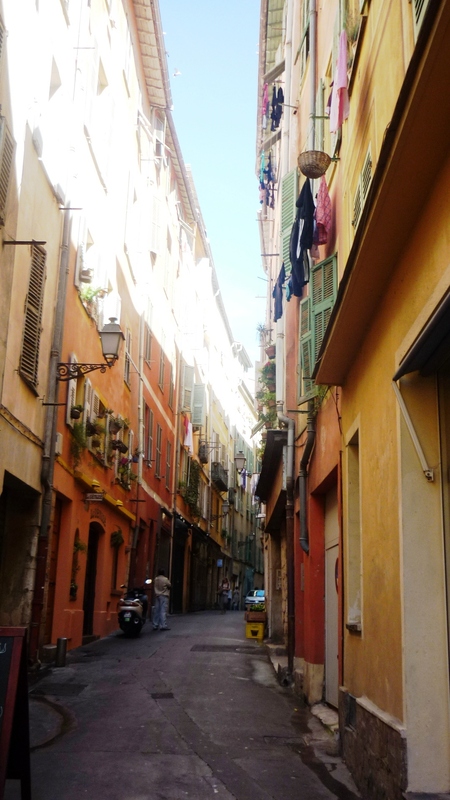 You’ll note that Old Nice is very cool, even in the heat of the summer – this is because of the shade and the very ingenious natural ventilation system devised by the locals when they designed the houses and alleyways hundreds of years ago. 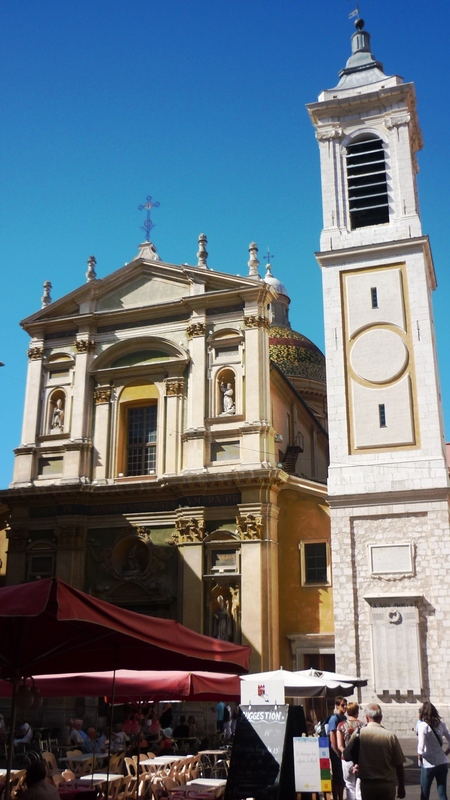 – As you head north of Place Rossetti, towards Place Garibaldi, the roads get slightly less lively and a bit more downmarket (plenty of kebab and fast food shops) but there are a few excellent restaurants. Also, make sure you visit the fish market (marché aux poissons) that is open every morning except Mondays until about 1.30pm on Place Saint François. Just bear in mind when walking round Old Nice that it’s not just a tourist area but also a prime residential neighbourhood – plenty of expats and locals live there due to its central location, mainly the younger ones given that most buildings are 4 or 5 stories high and don’t have lifts. This explains why there are plenty of grocery stores and regular shops catering for the locals, especially in this part of the neighbourhood. – Once you’ve reached Place Garibaldi (recently renovated in honour of the Italian freedom fighter), you can either walk towards the port, 5 minutes away, or head up the Castle Hill for some stunning views over Old Nice and the rest of the city and region – for more tips on how to enjoy your stay in the city, see my article Nice in a nutshell. For those leaving Nice by train, take the tram back towards avenue Jean Medecin and the railway station and for those taking the interurban buses, just saunter down Boulevard Jean Jaurès to the bus stop to head towards Monaco or Cannes. Where and what to eat and drink? 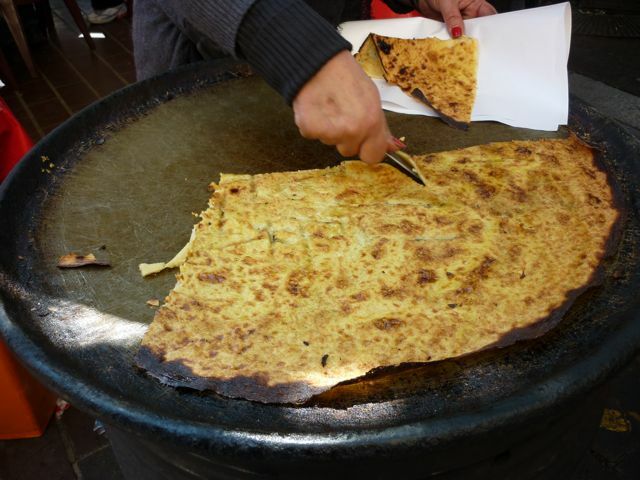 – A trip to Old Nice cannot be complete without sampling the main local dish, socca. This is a delicious pancake made of chick pea flour, water and olive oil and baked on a very wide cast iron pan – you can also find it on the Italian side of the border where it is known as farinata. Portions generally tend to be reasonably priced: the big pancake is cut up into little strips and covered in black pepper, then eaten with the fingers (careful, the strips can be very hot if they are served straight out of the oven, as they should be). If you want to find out more about this delicious speciality, the New York Times ran an interesting article with an easy recipe (as long as you have easy access to chick pea flour) a few years ago. 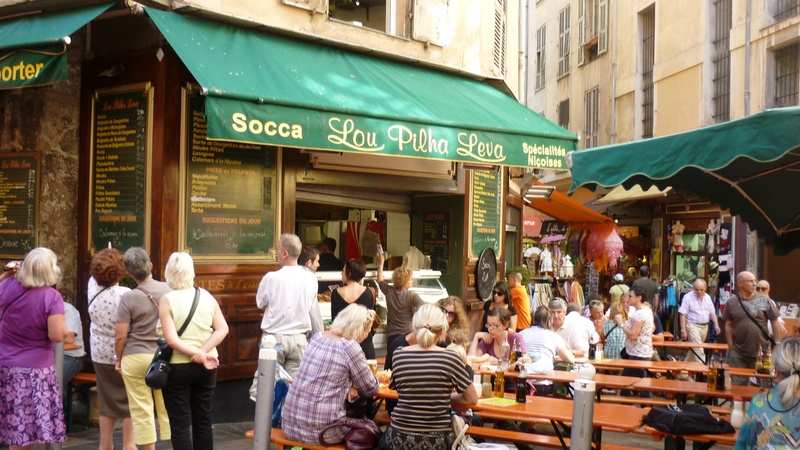 Amongst the best places to sample it is Lou Pilha Leva, located on a small square at 10 rue du Collet, not too far from Place Rossetti (I just noticed it had rotten reviews on Tripadvisor, but I personally like it so I’ll stand by my selection – if you try it out and disagree, please let me know!). The place is pretty rustic, as you eat on benches outdoors, but the socca is very good and reasonably priced at 2.80€ a portion so ideal for a quick snack lunch whilst exploring the Old Town – they also serve some more elaborate typical dishes like petits farcis niçois (vegetables, generally onions, tomatoes and courgettes stuffed with meat) and pasta with daube (beef stewed in red wine with mushrooms) sauce. 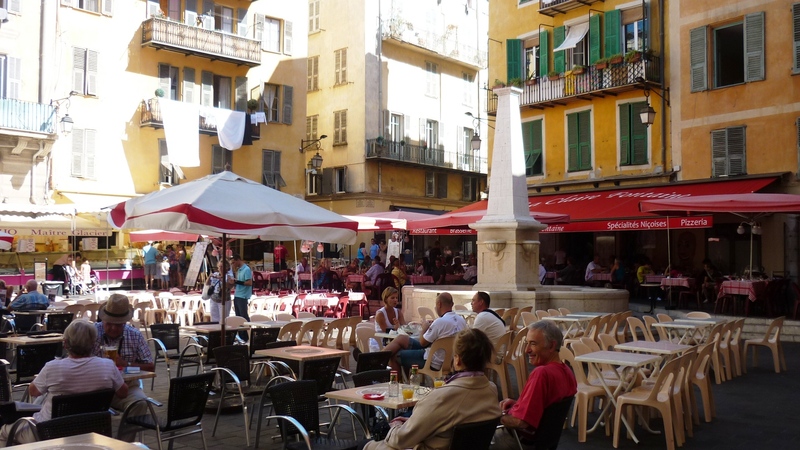 There is also another place recommended for its socca called Chez Theresa on the Cours Saleya. I’ve never tried eating there but this video will give you a good idea of the atmosphere on the Cours Saleya in summer! 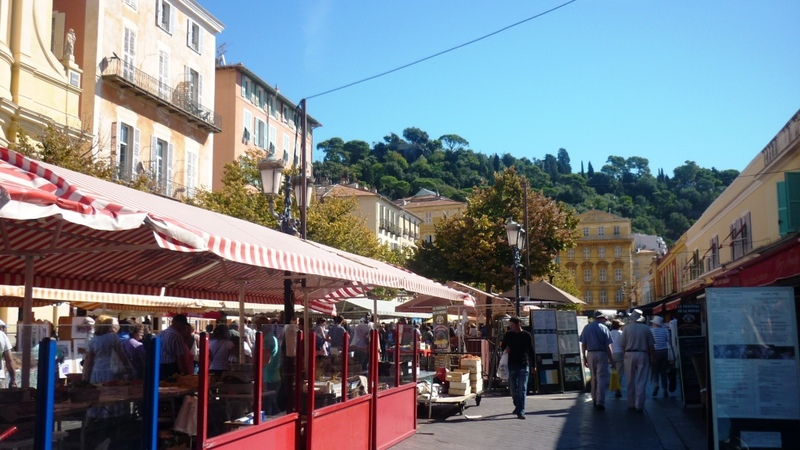 – If you want to stick to typical Niçois cuisine but with a sit-down meal, there is a multitude of places to choose from in Old Nice. My general rule of thumb would be to try to get a glimpse of the waiters and the chefs: the older they are, generally the better the food is – normally because the business is family owned and run. The same applies to the decoration – the good addresses don’t need fancy furniture to attract clients as long the food is good – and whether the place is packed with older locals or just tourists! Highly recommended for their great value for money and typical dishes are Chez Acchiardo (38, rue Droite), Restaurant da Gesu (1, Place du Jésus), le Bistro d’Antoine (27, rue de la Préfecture) and la Merenda (rue Raoul Bosio). – A decent place I recently tried, if you want something a bit different from Niçois cuisine, is La Villa (14, rue de l’Abbaye), which specialises in Corsican dishes. I stumbled on this restaurant by accident a few months ago and had a truly excellent meal at a reasonable price, so I can definitely recommend it. 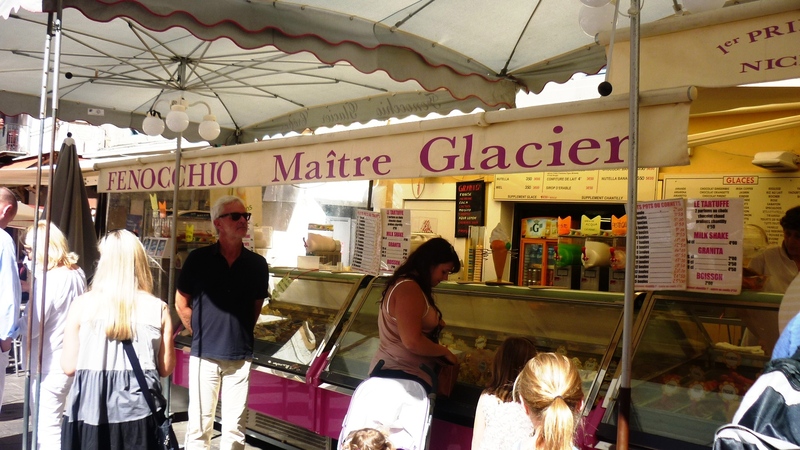 – No trip to Old Nice would be complete without a visit to the famous Fenocchio ice cream parlour located on Place Rossetti. There is always a big queue due to the quality of its Italian style ice cream and the huge selection of flavours, including some rather exotic ones that you can’t really find elsewhere, like tomato and basil, violets or chilli. But the traditional flavours are just as good! There is also another shop at 6, rue de la Poissonnerie, close to the eastern end of Cours Saleya but note that they only open from March to November. – Finally, if you want to get a drink, there are plenty of English or Irish style pubs and more continental lounge bars in the Old Town, most offering happy hour prices around aperitif time (generally from 5/6pm to 8pm) – most of these are located on Cours Saleya or rue de la Préfecture, but there are also quite a few in the streets around Place Rossetti. Just be wary late at night as there tend to be more and more fights around closing time on weekends, especially in summer (at around 2 or 3am) and generally avoid the darker streets of the Old Town, even though Nice at night is no dodgier than other any large French city. 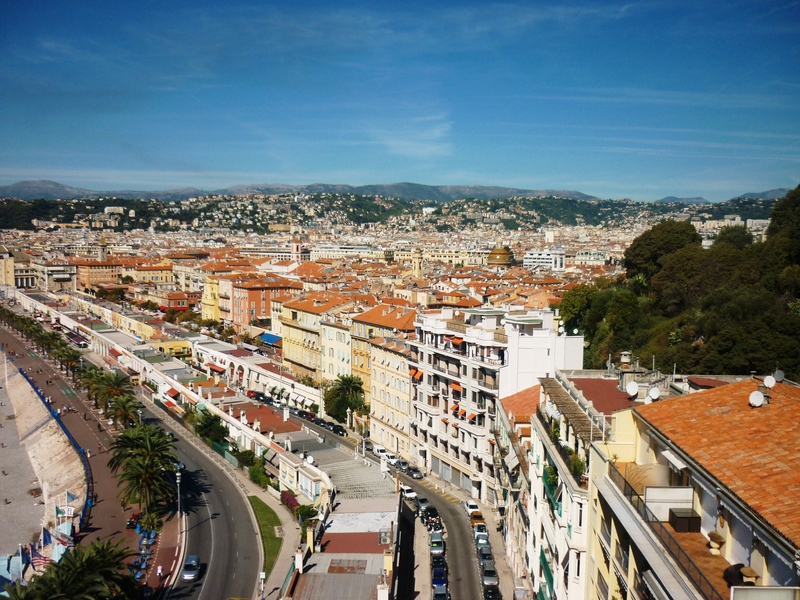 If you find any other good addresses in Old Nice, I’ll be happy to test them out – please let me know in the comments section below. Same applies if you have any feedback on the places I recommended, I’d love to hear from you. From the Nice Ville train station: either walk about 20 minutes down avenue Jean Medecin through Place Massena or else take a short tram ride (1.50€). The train station is being renovated as of 2013 and the building work will be over in around 2016, so expect a little bit of disruption in the meantime and plan ahead to get your tickets. From the bus stops, arriving from Cannes (to the west) or Menton/Monaco (to the east): until the completion of the new bus station in 2016, most buses will terminate. near avenue Felix Faure: just cross over the large esplanade and you’ll be in the Old Town, you can’t really miss the spires of the churches when you get off the bus! This entry was posted in Nice, Where to eat on the Riviera and tagged acchiardo, Azur, bistro antoine, Côte d'Azur, church, Cote, cours saleya, daube, eating old nice, essential nice, finocchio, flower market nice, french, french riviera, french riviera blog, frenchriviera, frenchrivierablog, holiday, ice cream, kevin hin, lascaris, leisure, lou pilha leva, mountains, nice france, nice riviera, old nice, riviera, rossetti, sainte réparate, saleya, seaside, socca, travel, vacation, vieux nice. Bookmark the permalink. Not a big fan of Lou Pilha Leva myself! For me the best Socca and other local dishes are at René Socca, 2 rue Miralhéti. The usual long queue just shows its popularity! Just need to know how it works : queue to order and pay for your food, then either take away, or sit down at the tables and order your drinks from the waiters. Théresa has a stall at the flower market, the Socca comes on a trailer pulled by a small moped, this is actually a very funny thing to see. Her socca is excellent, just buy a portion and stroll the market. Favorite restaurant : Lu Fran Calin, 5 rue Francis Gallo. Great starter plate with local specialties, and the best gnocchi and ravioli in town, all at a fair price. Plus they have a nice terrace. Thanks to both of you for your advice and the feedback. I’ll definitely check out Lu Fran Calin and la Favola when I next go to Nice! A wonderful guide, thanks Kevin! Thanks for your blog! I and my family will be in Nice in august and your wonderful descriptions and itineraries are an extraordinaire guide for us. Thanks, glad that you are finding the articles helpful. I’ll be posting several more before the time you come to visit so watch this space. Have a great time on the Riviera in August! Ok, I will wait “avec impatience”! We loved the walking tour including the ice cream recommendation: Fenocchio. I am an ice cream connoseure and this is the BEST I’ve eaten in years (including my home made). I have never seen so many flavor choices including the exotic ones. Thanks! La Villa? Seriously? It’s a shameful place which undermines the credibility of any other review you make. It’s a tourist trap staffed by those concerned only with a constant stream of unsuspecting tourists for whom they have no care or respect. The location is all this place has. I’ve already had questions before about this matter and unfortunately there don’t seem to be that many places in Nice or on the Riviera in general that cater specifically for coeliac sufferers. I took a look on the internet and this address came out http://www.sortirsansgluten.com/?page=etablissement.php&eta=32 . 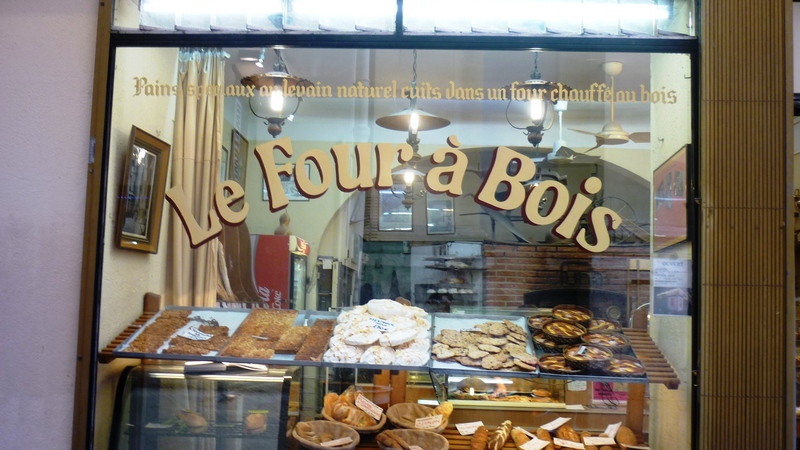 It’s located in the city centre, not far from avenue Jean Médecin, the main shopping street. If ever you get the opportunity to visit Monaco, there is also a pizza place tucked away behind the port, not far from the train station that serves organic pizzas where you can choose a gluten free option http://www.aperopizzaetc.mc/ . Locals tend to be very open and comprehensive of any form of allergy so will guide you as much as they can. Good luck and I hope that you enjoy your stay on the Riviera! for cheap too. Delicious !!!! lovely post. hope to go along this trail soon! Hey! I visited Nice earlier this year. And I discovered this store in the Old Town. Thea sold hand made items inside of squared glases. (not drinking glases, more like the shape of dice). The items would be stuff luke the blue chair, air balloon, diver or fishes. Do you have any idea what this store is called or if they have a website? Please reply by sending me a e-mail! I’ve tried googling everything!! No sorry, not off the top of my head but when I next return I’ll keep an eye out and let you know if I find something!